Better yet, why will you do it? Why are you working? Why are you getting up each day, going through the same routine, and spending time away from loved ones? If your answer doesn’t have something to do with discovering your potential, with learning how good you can be, you may have a clue on why the daily grind can seem so difficult. 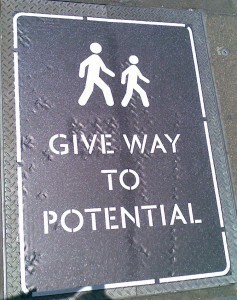 What is your greater potential? If that question is too big, try this: What value, what ideal do you wish to stand for even more? The projects will keep piling up. The market (and your boss) will continue demanding more. The tedious meetings will never end. And you’ll never see your email inbox empty. But it’s not about the job. It’s about you. Why? This is a fun one. Why would I not get up everyday to work out with great people and then get to my desk to work with more great people helping make health care better for all? After all of that I get to go home and hear what my 5 children learned at school and help them with their homework. I get to hear amazing stories, they are so excited about the cool new games their friends are playing and cool new things they learned in science. Don’t get me wrong, it’s not all fun and games but make sure you focus on what’s important. Nick – your “whys” are compelling and it’s great to see you leading up important work as well as prioritizing your family. Here’s to your Leadership! I am impressed but not surprised by Nick’s comment that it’s not all fun and games but make sure you focus on what’s important. This perspective is essential to longevity: health, career, relationships. Your 5 kids are lucky to have a dad that understands and models this perspective. Because I feel I can make a difference in someone’s life everyday and I work with 8 of the most fabulous women on earth. We are all working toward a common goal and it makes me happy to delight our customer. For us trainers the customer is the sales rep. I love seeing them bloom! Sabrina – Thank you for your commitment to bringing out the potential in others. Clearly you’re passionate about your work and colleagues and we can all learn from your dedication to greatness. Because I realize everyday is a gift given. Everyday that is given is another opportunity to make it better than the day before. Drawing closer to my purpose is a lifelong journey…and just when I think I have reached my destination, I discover another path I must take…it is my choice if I can make it adventurous and exciting! That’s why! Thanks for the reminder that life is all about the journey, Jackie. Here’s to the adventure! My why is that the highest of human values is achieved through the service we deliver. The greatest leaders are those who know that to lead truely means to serve. I dont need a headstone when I am gone, I want it to matter that I walked this way. Patricia – you are a model for many leaders and I think you might already be among the “great leaders” you mentioned. Thanks for sharing what’s important to you.